I have some sad news to share with you. 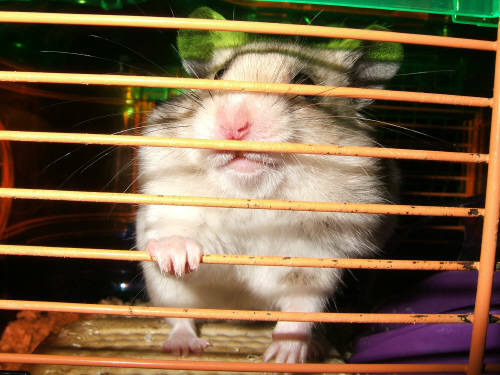 Today, quite suddenly and unexpectedly, The Hamster died. He'd seemed completely fine yesterday, full of character, eating as normal, trying to escape as normal, but this afternoon I found a sad little heap in the corner of his cage. So sorry Mel. Hope the kiddos are taking it okay. Oh, how sad. Hope The Children are ok? And who will do your next "pick-the-winner"? He'll be a tough act to follow. Oh, so sad. He was also the best ever picker of random winners. We'll miss him and hugs to the children, too. He was such a clever little soul and brought many a smile to your blog friends with his antics when choosing winners. awe, I am so very sorry to read of your sad news. What a shock for you all. I'm sorry to hear that. My daughter calls her frozen peas 'little fella' so the news is worse than I initially thought. I hope The Children are bearing up. Oh, no! That's so sad! My heart goes out to you all. Our condolences from the family who struggle to keep small animals alive - read stick insects and fish. We will miss his unique ability to select random winners for blog drawings. You have my sympathies! He was a great winner picker! Oh no! I'm very sorry Mel! I hope the kiddos are doing okay. Always so sad when you lose a pet, hope The Children are coping okay. It must have come as a bit of a shock if he hadn't been showing signs of slowing down. Will you be getting another pet? That is very sad news. He looks like a very cute little fella. Sending hugs.